Sebastian Vettel's decision to leave Red Bull was influenced by the pace of his team-mate Daniel Ricciardo, team boss Christian Horner says. Horner says Ricciardo was "probably a factor" in Vettel's decision. And he said the Australian's overtake of Vettel at the Italian GP was "quite a defining moment for Sebastian". 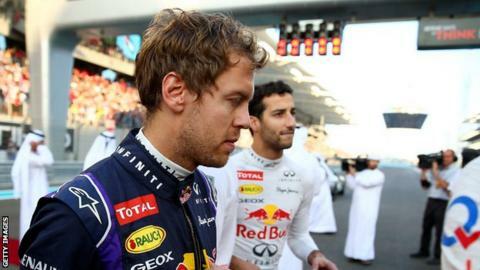 Horner, speaking in an interview for the BBC F1 review show, said of Vettel: "He was enormously frustrated after that grand prix. "It was at a time where after the summer break, knowing Sebastian as well as I do, I could see he was very distracted and it was obvious something was at the back of his mind. "And I think Ferrari were courting him quite hard and around Spa/Monza was the time he made the decision to do something different next year." Horner said he was "not really" surprised Vettel decided to leave and move to Ferrari as a replacement for Fernando Alonso, who negotiated an early exit from his contract. "By the time he got to Singapore you could see he was a different person," Horner said. "He was more relaxed and you could see he had made his mind up, but events had to unfold through Fernando actually leaving Ferrari. So, no, it wasn't a great surprise in the end." Vettel has insisted he is "not running away from anything" at Red Bull and that he simply wanted a change of scenery and the chance to drive for Ferrari, where his childhood hero and later friend Michael Schumacher won five world titles. Horner said: "The timing was right for Sebastian. He'd had a great run with us. He'd been with Red Bull since 12 years of age. "The lure of Ferrari for any driver is immensely powerful." Vettel finished fifth in the championship, with Ricciardo third, having been out-scored by 71 points. Ricciardo out-qualified his team-mate 12 times in 19 races. Horner said Vettel struggled to adapt to the new cars in F1 this year following the introduction of V6 turbo hybrid engines, reductions in downforce and a fuel restriction. "He didn't like what F1 had become and was quite vocal about it - didn't like the engines, the noise, the way the car felt," Horner said. "He was pretty upset about that at the beginning but once he realised that was it - it wasn't going to change - he started to get his head around it. He worked very hard, as he always has. "But he got very frustrated the car wasn't doing what he wanted it to do and of course to compound that his team-mate is winning a couple of races and performing at the level he was." Horner said the banning of exhaust-influenced rear aerodynamics, a technology in which Red Bull had excelled in the previous four seasons, had a big effect on Vettel. "The rule changes were significant and the two guys who seem to have been affected most are Seb and Kimi and I think taking away the rear downforce has actually been a big factor for Sebastian," Horner said. "How he generated his lap time was very much using the rear of the car on entry into the slower corners, which was much diminished this year, and that together with the brake-by-wire system had taken away some of the feeling of the braking that he is so dependent on. "He is such a 'feel' driver that some of those feelings had been muted and it dumbed down some of his performance."